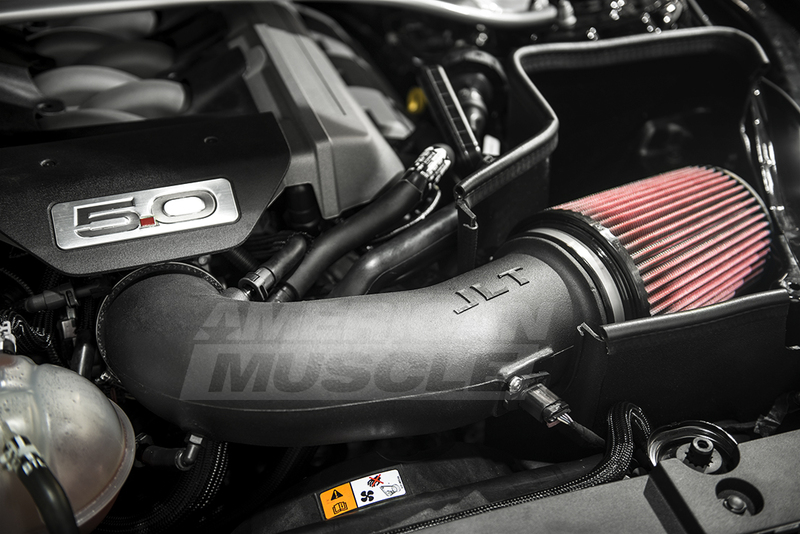 HOT NEW 2015 Mustang Parts from JLT Performance! Our friends over at JLT stopped by AmericanMuscle with some brand new parts for the 2015 Mustang! JLT stopped by our offices to test some new products on our brand new black 2015 Mustang GT which came all the way from a Tennessee Ford Dealership. The aftermarket for 2015 Mustang Parts is growing by the day, with more and more manufacturers pumping out parts for the sixth generation of the iconic Pony car. JLT has stepped up to the plate with their brand new parts for the 2015 Mustang and we could not be more excited! JLT has built a large chunk of their reputation on the quality of their cold air intakes which they have been producing for years. JLT cold air intakes are some of the highest-quality intakes on the market, offering huge gains to Mustang owners that choose to run them. 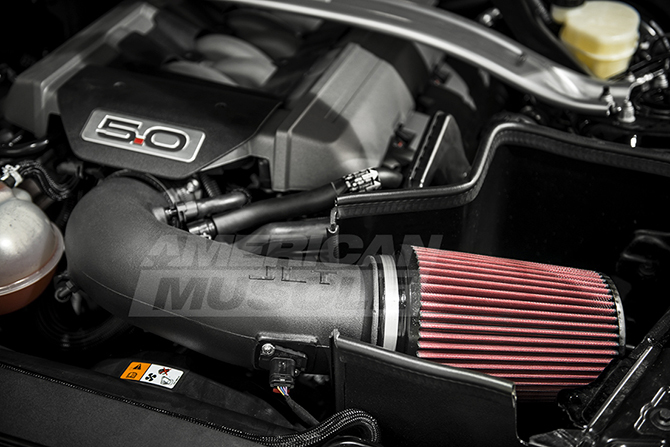 Their cold air intake for the 2015 Mustang is set to be the best one yet! Using similar technology to that of the 2011 – 2014 cold air intakes, JLT built a brand new cold air intake designed to maximize air flow, keep engine temperatures lower, and create big power. The new cold air intake utilizes larger intake tubing and an unrestricted air filter to allow the 2015 motors to breathe easier, which creates more power. From a technical stand point, the cold air intake tubing is 110mm at the MAF sensor and features a molded heat shield, fresh air duct, 5″ filter opening and a 4″ opening at the throttle body. 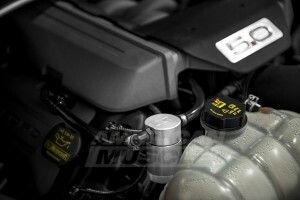 Oil Separators have proven to be an amazing modification for Mustang owners, providing improved engine performance and longevity. JLT has been one of the most popular choices for oil separators and they are continuing their offering of oil separators for the 2015 Mustang. Oil Separators function by keeping the oily vapors that are expelled after combustion from returning into your engine, which can dirty your intake manifold and dilute the octane you have in your car; basically they help maintain your car’s performance. JLT’s 2015 Mustang oil separator will be sure to keep your new engine running strong for a long time. Previous Entry Hot Lap: Project Fox Body, 2015 Mustang News and Giveaways, New Products and More! Next Entry 2015 Shelby Mustang is Coming From Las Vegas Shelby Plant!